Utility tanks are polyethylene portable containers designed for commercial and residential uses. Utility tanks are also known as transportation tanks, pest control tanks, sprayer tanks, pressure washer tanks, and detailing tanks. Utility tanks are commonly used for transporting and storing water and chemicals, fertilizers and pesticides. Principal applications include agricultural, manufacturing and industrial uses, transportation, and mobile auto detailing. Polyethylene Utility tanks are available in many dimensions to meet individual job needs and requirements. Capacities are offered from 26 gallons to 500 gallons. Protank’s plastic utility tanks are freestanding and do not require additional support when stationary. When transporting, metal bands are available to secure the utility tank. Tank lids are threaded and vented for multi-use and ease of operation. These utility tanks have outlet fittings and are customizable. 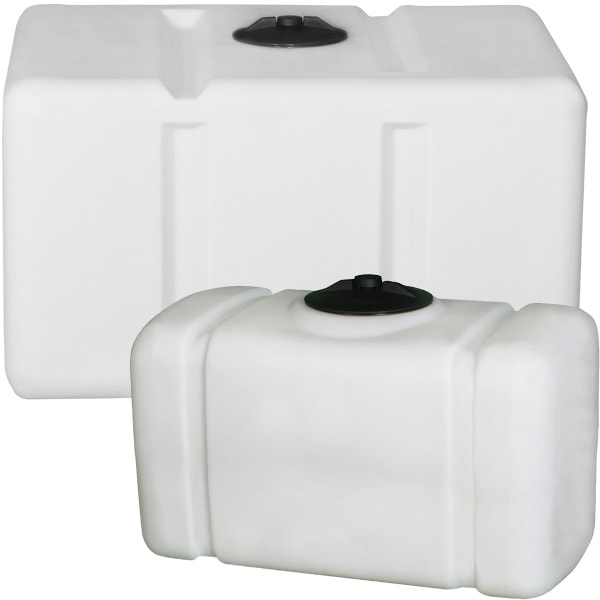 Protank’s poly utility tanks are seamlessly molded from high density polyethylene virgin resin. Seamless tank manufacture adds significant tank structural integrity and durability. Tank manufacturing includes UV stabilizers to protect against sun damage and makes them indoor and outdoor use ready. Protank’s plastic utility tanks are durable against ranging temperature and harsh weather, contributing to increased tank service life. Tank colors white, black, and yellow are available. White and black utility tanks are approved for potable water per U.S. FDA standards and requirements. White and yellow tanks are translucent, which allows easier reading of internal liquid levels. Exterior gallon indicators are present on all Protank flat bottom utility tanks to aid in fluid level reading. Protank’s utility tanks can be customized based on need and are offered with a manufacturer’s 3 year warranty. Contact Protank about custom utility tank fabrication, chemical compatibility or application questions, or for further general information on portable polyethylene utility tanks.